Buick Renaissance: Yet Another Riviera Teaser? Buick teases a second concept in as many years. Will GM’s premium brand build it? Buick Avista concept makes its global debut in Detroit. Rumblings of a surprise Buick reveal just ahead of the press days for the 2016 North American International Auto Show (Detroit Auto Show) suddenly grew loud on Sunday morning. GM’s premium brand had not only had made known its plans to debut its imported-from-China Buick Envision compact SUV, but the company said a second model would also be introduced. In particular, rumors of exactly what that model might be were shared on Saturday and soon raised social media chatter to a near fevered pitch. Would the unseen model be the production version of the Avenir concept introduced at the 2015 show? Or, was Buick planning to bring back the Grand National popularized in the late 1980s? Those were the two dominant reports, but in the end, neither one panned out. Instead, Buick introduced the Avista concept, a model that shares its platform with two other GM vehicles — the Chevrolet Camaro and Cadillac ATS. 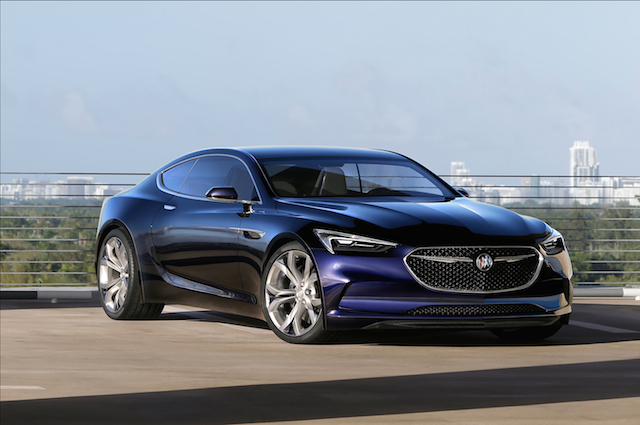 The 2+2 concept coupe effectively accomplishes two things: it reinforces the brand’s new styling direction and it points to a time when coupes such as the Grand National and the Riviera were important models in the Buick lineup. Like the Avenir, the Avista may never be built. If it is, let’s hope that the name disappears — the same should be said for the Avenir. Buick certainly has a strong history of wonderful model names that could be resurrected. Some people contend that the concept *is* the Grand National. If so, then it would represent a clean departure from the Regal, the same model the original rear-wheel drive Grand National was based on. The current Regal is a different vehicle entirely — front-wheel drive is standard and all-wheel drive is available. Moreover, the North American-spec Regal is based entirely on the Opel Insignia. Choosing the Riviera name seems like the better choice. The Avista is both elegant and sporty, just as was the Riviera of lore. Based on a 110.7-inch wheelbase, the coupe would come in slightly smaller than the LaCrosse, but larger than the Regal. Earlier Riviera models were full-size, then were gradually downsized. Under the hood is a 3.0-liter, twin-turbo V-6 engine making 400 horsepower, the same engine slated to power the upcoming Cadillac CT6 sedan. The engine is paired with an 8-speed automatic transmission. With proportions aligning close to the Chevrolet Camaro, the Avista concept should be blistering fast, rivaling the performance of certain Mercedes-Benz, BMW and Lexus rivals, but perhaps without the exorbitant price. The Avista’s countenance is powerful and confident with sweeping body lines from stem to stern. It has an aggressive stance and its wide track and 20-inch wheels point to a formidable model. That same flowing expression is found inside as uninterrupted lines, state-of-the-art seats, and an advanced center console are present. The social media buzz following the Avista’s reveal was overwhelmingly positive. Indeed, the majority of pundits hope that the coupe will be built, although some people seem hung up on the model name. That Buick has shown us two rear-wheel drive concepts in the space of a year, strongly suggests that a high-end or halo model will be built. Buick’s survival following GM’s 2009 bankruptcy was questioned by many, especially as its continued existence came at the expense of Pontiac. But then, Pontiac wasn’t a brand known outside of North America, while Buick has enjoyed a strong following in China where most of its products are sold. Whether designed exclusively for North America or with a more global audience in mind, a rear-wheel drive Buick coupe might stir more interest in GM’s premium brand than anything else to date. And unlike the Opel-derived Verano, Regal and Cascada models or its fleet of SUVs and the LaCrosse sedan, this model’s DNA is American performance, an entirely beneficial attribute at that. Photos copyright General Motors Company.